Due to the multifaceted nature of sleep disorders they have to be treated differently. Generally, therapy is based on 3 pillars. providing the patient with information on normal sleep, sleep hygiene, sleep disorders in an individual or group therapy setting; relaxation strategies, behavioral therapy, etc. mandibulary advancement devices (Fig. 1a+b), surgical interventions, e.g. uvulopalatopharyngoplasty (UPPP), nasal continuous positive airway pressure (nCPAP) (Fig. 2), sleep deprivation, light therapy (Fig. 3), etc. 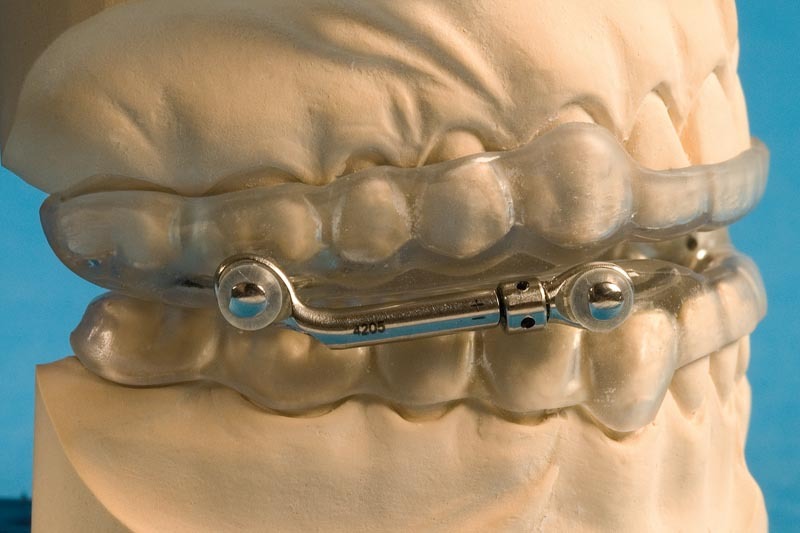 Fig.1a Mandibular advancement device (MAD) and its function. Fig. 1a+b. Mandibular advancement device (MAD) and its function. MADs hold the lower jaw forward and thus provide more space for the air flow. For further information see www.parodontologie.at. Fig. 2. Nasal continuous positive airway pressure (nCPAP). A stream of compressed air is delivered via a hose to a nose mask, thus preventing a slackening of the muscles of the pharynx so that unobstructed breathing becomes possible. Fig. 2. Nasal continuous positive airway pressure (nCPAP). Fig. 3. Light therapy and actigraphy. 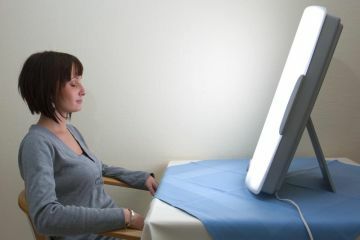 The light therapy lamp on the table is used to treat seasonal affective disorder but also sleep-wake rhythm disorders, which can be evaluated by means of an actigraph. hypnotics, tranquilizers, antidepressants (Fig. 4), neuroleptics, psychostimulants, dopaminergic agents (Fig. 5), etc. 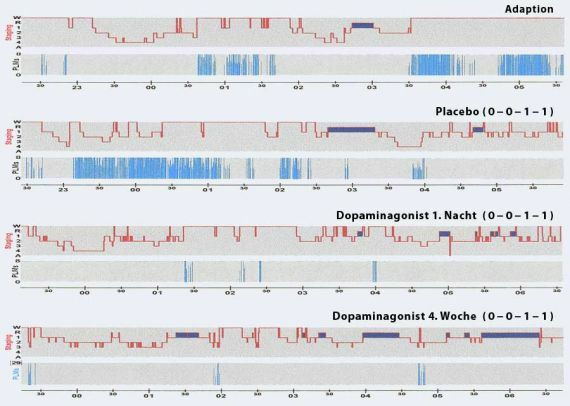 As on the one hand different sleep disorders induce different changes in sleep architecture and on the other hand psychotropic drugs influence sleep patterns differently, the aim of successful treatment is to provide each patient with a drug that is able to normalize aberrant sleep architecture variables in the sense of a key-lock principle. Fig. 4. Sleep profile of a 50-year-old patient with nonorganic insomnia associated with a recurrent depressive disorder before and after treatment with a sleep-promoting antidepressant as compared with a normal control subject. Whereas before treatment the patient suffers from pronounced early and late insomnia, under medication the sleep profile normalizes. Fig. 5. Restless legs syndrome and dopaminergic treatment. 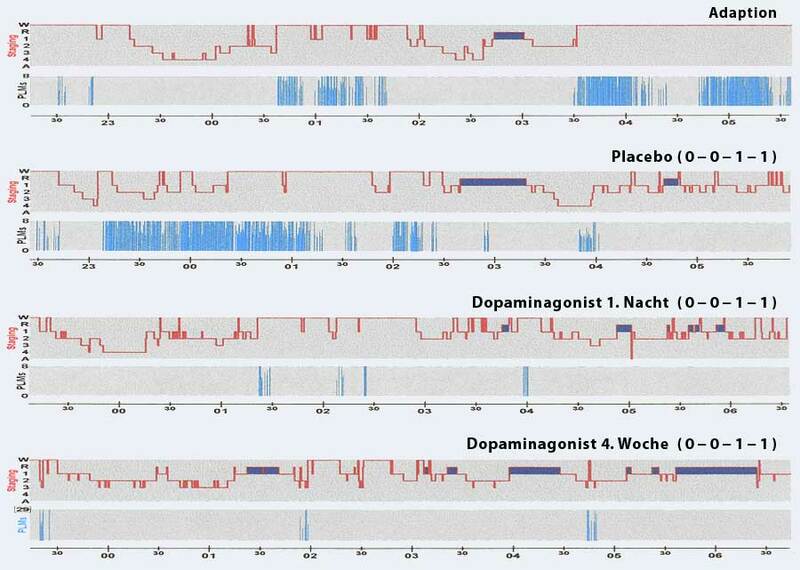 Sleep profile and periodic leg movements (PLM) of a 59-year-old patient before and after dopaminergic therapy (adaptation night, placebo night, dopamine agonist night 1, dopamine agonist week 4). Whereas in the adaptation and placebo night PLM were high (413 and 494/TIB, respectively), after acute and chronic treatment the PLM number was reduced to 35 and 29, respectively. Fig. 5. Restless legs syndrome and dopaminergic treatment. As sleep disorders are hardly ever an isolated problem but are often associated with other diseases (comorbidities), the Sleep Laboratory Rudolfinerhaus maintains a close collaboration with other specialists. With snoring and sleep-related breathing disorders, for instance, an ENT specialist as well as a pulmologist are consulted. Depending on the findings in an individual patient, therapeutic strategies may comprise behavioral counseling and/or pharmacological treatment, surgical interventions (e.g. uvulopalatopharyngoplasty), dental approaches (e.g. mandibular advancement device, Fig. 1) as well as pulmological measures (nCPAP, Fig. 2).